Last Christmas, I was bound and determined to not bring more clutter into my home. Having just recently , the last thing I wanted was more, well, junk filling our house. I decided to chose a couple of needed articles of clothing and then only gave consumable gifts. Consumable gifts are a great way to have something to put under the tree to rip open on Christmas morning, without cluttering your home or the homes of others. Think about some of the purchased treats your kids love and ask for all the time, but don’t usually make the “budget cut.” Think about those cookies your sister makes that are your son’s absolute favorite in the world! These are great things to ask for as gifts! Your kids will be delighted to have those special treats tucked in a lunch bag or for a fun afternoon snack. Truthfully, my husband and I do this for each other, too. He adores Monster energy drinks and I love pizza-flavored Combos, but we don’t purchase them ordinarily. Christmas is a fun time to indulge each other. Even better? Once the treats are eaten, there’s nothing left cluttering up our home! My sister-in-law once gave my children a three-pack of those “fizzy bath bomb” balls that you drop in the bath tub. My kids thought they were amazing and I was thrilled that, after three joyful, giggling baths, they were gone. My sister and her family gave my kids little Disney soaps one time too… they brought many smiles while they lasted! Aim for small, specialty items in this category, rather than ultra-jumbo bottles of bubble bath. When people ask for ideas for my children, these top the list. They are all readily available, inexpensive and cheap to ship for those out-of-staters. My children love sitting at their art table, coloring or solving fun puzzles and decorating with stickers. What I love? When it’s done, it’s done. I’ve never had a child miss a completed coloring book that I’ve tossed. My kids, like most children, love to cook. Pre-measured cookie, quick bread or muffin kits make wonderful gifts! These can be mixes you put together on your own or even mixes you just buy in the store — children will be delighted either way. We also happen to have a hand-me-down EasyBake oven. If you, or someone you know, does too, you could also make up some fun little mixes to be baked in there. I’ve had great success with the ! By this, I mean craft kits designed to make gifts for others. My kids love to make bracelets, bookmarks and magnets for their grandmas and aunties. The “gift” for them is in the fun they have doing the crafting! Craft kits keep them happy (and entertained) for many hours and, when they’re done, the results are happily passed on to others with much pride and joy. Win-win! Do you have any tips for cooking back on the clutter at Christmastime? Share it in the comments! This year my husband decided against buying any toys. In fact, we are going to be cleaning the basement (play room) of MANY of the toys because there is just TOO many. Everyone is overwhelmed. My husband spoke to me last week about making a puppet show theater, which I know my kids will love! My 3-year old loves music, so we thought of getting him a new cd (he already owns musical instruments!) If we think carefully enough, we can come up with more practical, useful “things”. I do love the consumable idea as well. Thank you for sharing 🙂 I will consider them when we shop, for sure! Great post! I have always given consumable gifts for birthday presents when my kids get invited to parties. I figure they’ve got 20 kids giving them 20 gifts that will all be broken or ignored within a few days. I usually gave color books or candy or other things that could be used up. Now that they’re older, the kids are all about the gift cards or cash. @Kim, I love the parents who choose consumable gifts for my kids. We received some “giant coloring pages” at my daughter’s last birthday and those were fantastic! Our children are “big kids”. Along with age came a new desire to try new things. Tayah and Tyler love gymnastics, tumbling, football and basketball just to name a few. They have recently sparked an interest in music classes and karate! The cost is usually around $35 per child, per sport per month at the rec center. This year, when people ask what our children want for Christmas, we are going to request a check made payable to the rec center where they participate. This will keep our home free of clutter and will allow our children to try lots of different activities throughout the year! @Kassandra Wood, “Experience gifts” and “charitable gifts” help round out my clutter-free Christmas plan– I think classes are wonderful gifts! @Kassandra Wood, We do this for our young children- my inlaws give us a family zoo membership and science museum membership. It’s great. I don’t have to clean it, wash it, put it away, and it doesn’t break or wear out! And nobody fights over it. One of our favorite things to give/receive are experiences. Grandpa (my kids’ only living grandparent) loves gift certificates to places where he can take the kids. The kids might be teenagers now, but they still love to go hit a bucket of golf balls or go to the local theater with him. We’ve also given (and received) zoo memberships to the one non-related family we exchange with as family gifts. Candles are also a good consumable gift. When the kids were as young as 2, they used to love to make beeswax candles out of the beeswax sheets to give as gifts. They needed a little help to get it started around the wick, but it was quite easy for the little ones to roll them up, and everyone loved it. @Carolyn, Experience gifts are some of the best- my children have received classes from the grandparents before (karate, ballet, etc.) and I treasure those experiences for them! To make a very nice presentation, buy celephane bags from a florist shop. They are VERY inexpensive but look very elegant when tied with a ribbon. You can use them for your mixes and also for cookies and candies. My mom makes 5,000-7,000 (not a typo) gingerbread men every year and this is what she uses. People love the look! @[email protected] On A Dime, I got tired just thinking of making all those gingerbread men! Great tip about the florist bags- thanks for sharing! I do this a lot with holiday decorating as well. I like to use natural items such as holly, ivy, evergreens trimmings from our trees, pinecones, dried herbs, etc. Then when it’s all finished–it goes back outside for compost. So much nicer than having to finding a place to keep store bought wreaths, garlands, etc. I also love finding ways to use paper for projects as then it too can be put into recycle bins when finished. Great idea, Rhonda! I’ve never thought of that. @Rhonda, Very smart of you! We have a mix of natural/artificial things around here… but the natural decorations are always the most beautiful and fragrant! I love consumable gifts…both to give and to receive. My husband and I enjoy a glass of wine on occasion but very rarely buy any. So, we’re thrilled when my brother (who works for a vineyard) gives us a few bottles at Christmas. Last year my brother in law raved about our home canned peaches. So this summer I canned 12 quarts for him. I love this gift and I’m hoping that it shows him that I listened to him and cared enough to spend time doing that work for him. Also, if he saves the jars I am thrilled to refill them next summer! My kids love skittles and craisins and fruit snacks and lucky charms and other food items that I don’t purchase frequently. They are just as thrilled unwrapping those things on Christmas morning as they are when they get fancy new toys! I think the important thing about these kinds of gifts is to know the recipient. Giving good consumable gifts shows that you know the person you are giving a gift and you know what they like. I think that’s the best part of the gift! @Kristin, Ooh, I’d love to be the recipient of canned peaches… sounds wonderful and so thoughtful! My 2 year old memorized Psalm 100 for her daddy for his birthday this year. He loved it, and now she has it memorized! It was neat because it was something she could actually work at doing for him. She was so excited to say it for him on his birthday (she’s a pretty verbal 2 year old). I was thinking of doing a new portion for Christmas–I better get on that! We do consumable gifts every year. Last year it was frozen cookie dough, so they could bake it after all the holiday sweets were gone! It was fun to hand-deliver to each family (since it had to go straight into the freezer!). @Sami, That story of memorizing the Psalm just warmed my heart. Beautiful. I love ideas like these. We are so lucky to have family members buy all our son’s clothing and toys that we really don’t find the need to buy more stuff for him when he only likes it a few weeks anyway. For our son’s birthday and Christmas we buy passes to local places like the zoo and children’s science center. I’m thinking about getting a Y membership this year. Its nice that one it doesn’t create clutter, but two it provides a year full of experiences for the whole family. @Ashlee, That is such a good idea!! My daughter asked for tap lessons and we suggested it as a Christmas present. She still isn’t sure about that but I feel like it has been a good lesson on choosing what is most important to you! I did the cookies and bread mix in a jar one year. They were a huge hit. @Jill, Do you guys have any good recipes for cookie mixes? My husband goes bananas during the summer picking berries. Loads of them. So…I have been making homemade jams to give to friends and family! I’ve worked a little at a time and the last round was almost 300 ounces total!! Last year we made soups and people were sending jars back asking for more. I think its a great way to express your love and what memories you build while your slaving over the stove!!! @heather, Home cooking is such a good way of sharing from the heart, I think! I’ve never done soups, but I love the idea. I was dreading adding more stuff to my daughter’s toy box (especially since we have a new baby, hence more stuff, coming in March!). My husband and I decided we wanted to get a swing set for her, and then just fill her stocking. But what to put in the stocking? Now I know! Her stocking will be filled with crayons, paper, bubble bath, oreos, capri sun and big girl underwear! All stuff she loves, but doesn’t get all the time, and will not over stuff her toy box! Thank you thank you thank you…a million times for this post! Crunchy Betty is a blog where the writer makes homemade beauty and household products. You could put together a few ingredients and give a “spa” gift. More for the adults or young ladies on your list but still “consumable”. Love this idea. We just had a birthday at our house and have been having the whole conversation about STUFF. @Beth, “Stuff” can be overwhelming, in my opinion… and then it’s no fun at all! I love consumable gifts for grown-ups too. I love giving homemade gifts and consumable gifts for Christmas. I always fill the kids stockings with the candy that they like. For those kids in the family, that are in college, I love getting other relatives to fill a box of items that they need, such as: soap, snacks, deodorate, etc. I love the jar of soup, I am going to try this for some people I would love to give a small gift to, but not sure what to get them. I do all kinds of baked goods, but not sure if these older people want junk food. My neighbors sure do love the goodies. Thanks for all the ideas – my head is just a spinning. I’m thinking about doing edible gifts for family this year. I also like to bake cookies for friends and neighbors every year. However, my only concern is that so many people are battling weight problems, and I hate to sabotage them. Maybe they want to be sabotaged, but still, I’d rather not. So I’m trying to find healthier food gifts. Maybe a soup mix? @Heather, Soup mix, trail mix, homemade crackers or granola… maybe a cocoa mix made with Splenda? I’m guilty of not being super health conscious with my food gifts, but I bet there are still a lot of fun edible things to share as gifts! The recipes that I prefer are from the OMSI (oregon museum of science and indusrty) website. The play dough is super soft and last for MONTHS in an air tight container. Yesterday we made every color of the rainbow and as we worked I was thinking of what a great holiday gift this would make for cousins, neighbors, her preschool etc. Great ideas! I am in love with the homemade easy bake oven recipes!! !We have an easy bake oven that one of the grandma’s gave them several years ago but I never, ever buy them the replacement recipes to use with it. It’s always cheaper just to make “real food.” Thanks for the tips! i have been thinking about making jars of spice rubs, at least for the guys in our family. we love the chicken rub on 365 days of slowcooking. 🙂 this is also a good option to avoid making sweets for people who may be watching their weight. This year is the year I finally became fed up with the over consumerism of Christmas and as a family we decided to go back to a simpler holiday. So, for Christmas Eve we are having dinner at our house, with about 20 relatives, and instead of opening gifts after dinner we are going to have a Gingerbread House building contest. Our children will be able to spend some quality time with their aunts/uncles/grandparents/cousins and will receive the gift of “family” instead of just another toy to add to the pile. @Lisa, Sounds like a perfect holiday plan to me- simple and meaningful, as it should be! Sure! I hope to google more rubs but here are some seasonings we love to use. One of my kids favorite things is Crayola Color Wonder- something that seems to be used up in a week- is it just me or are those books thin on the pages?? So, I give that idea to people. I had a friend whose daughters invited all the children at their birthday party to bring a food item to donate to the local food pantry rather than a gift- love that idea! My favorite consummable gift to receive is a museum and/or zoo membership. Our families aren’t really sold on the idea of giving consummables (still working on it), so this is a great way for them to give a more “substantial” gift that excites the kids, gets lost of use, and doesn’t add to the clutter or materialism. Many memberships are also reciprocal with other locations – in fact, we always get a family membership given to one of our local museums in a small mid-west city/town (costs $70) and we have used that membership for free admittance to other ASTC museums across 5 different states (on vacation, when visiting relatives or friends, etc). I think its a great way to keep the toys down, but also appease relatives who want to buy things for the kids. The relatives also love getting the pictures through the year of our zoo and museum trips. Most zoos, The Association of Science and Technology Centers, and The Association of Childrens Museums all have reciprocal agreements that help maximize a membership. @Bethany, Ooh, great point about reciprocal museum memberships! My brother travels a lot and is often able to take his family along… they’ve been able to use their local museum membership all over the country. So smart! Hallelujah! I’ve been trying to figure out some inexpensive gifts that wouldn’t take up too much space. We have 4 kids and live in an 800 square ft. apartment. Thanks for all the wonderful ideas! @Amber, You’re very welcome- I bet you’ll come up with some great ideas that won’t clutter your space. 🙂 I try to stick to a combination of: consumable, experience, and charitable. None of those things take up space and they’re good lessons, in my opinion! I love the idea of making cooking kits for the kids! Never would have thought of that. 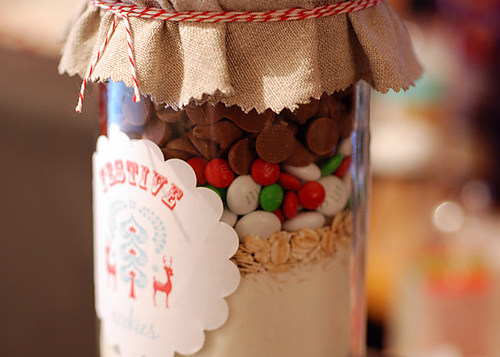 do you have the link/website for the recipe for the cookies in a jar pictures with the M & ms and oatmeal? so pretty! Like Lisa, I am making homemade candy for my children as well. For other people, I give home canned peaches and pears, as well as , pomegranate jelly, apricot jam and lavender jelly. @The Prudent Homemaker, I would also add post it notes and band aids to that list along with the tape and paper. @Lucky, Oh, I DID get some free post-it notes earlier this year! They would love those! Great idea! Bandaids! Brilliant. I can’t keep a box of bandaids in the house. I actually have to hide it in the garage. My kids would LOVE their own box. Brilliant! Absolutely brilliant! The idea had seriously never crossed my mind…good grief. We are a big fan of experiential gifts as well. Parks & Recs classes and spring soccer top my kids’ lists this year. @robbie @ going green mama, Our son received karate classes through Parks & Rec from grandparents last year and that has been SUCH a hit! I love gifts like that too…. so much more value than, say, some noisy plastic Transformer! Last year we bought a Roku player for about $100- now they are down to $60- $80 and it allows us to stream amazon on demand and Netflix to our TV a bunch of other great online channels. We are telling family and friends to give the kids amazon.com gift cards in place of any movies they may want to purchase. That way it’s all filed away on our Roku and not cluttering up our family room or getting lost or scratched or broken. I don’t know why I didn’t think of this when I posted earlier, I was focused on the kid aspect of it I guess. But my main gift to give this year is a hot drink basket. I got tons of great Christmas colored baskets for $.49 each at thrift stores and got really unique Christmas/winter mugs at thrift stores for less than a $1 each. Then with a few Jasmere deals I got several things of loose high quality tea and I scored free bags of fancy French coffee and biscuits from those RuLaLa credits. I’m also going to add inexpensive things like honey sticks, loose tea infusers, those individual fancy hot cocoa mixes, etc. I think it will be great because there is something in it for everyone and it can be customizable. Like my best friend loves tea so her basket won’t have coffee in it, just the tea. And the things people will actually consume are high quality products, but the “stuff” along with it is from a thrift store or dollar tree, so if it gets donated or thrown out, oh well! Also I am giving a basket of organic and more all natural stuff to my MIL who loves that stuff. I’ve collected so many great samples over the last few months and she just loves these kinds of things, so after just a few full size products she will get a great gift full of consumable stuff. I didn’t realize until you posted this that we are really headed towards consumable gifts. And the “stuff” we are buying is more meaningful (hand made afghan made to match their couch colors, photo books of the baby, etc). Thinking back to me gifts several years back, what a waste! This is great! As I’m sitting with my pad of paper writing the blogs to look at the websites, the recipes, and all the great ideas, I see my to do list getting bigger (but my spending getting lower!) I am trying to teach the kids some similar things so we will still do a blend of consumable ‘the stuff’. Hoping to go through old toys WITH the boys (at least the 6yr old) and teach him to give to others that might enjoy it. I do charitable gifts each year for each member of the family (including the cat of course) — I try to find an organization that reflects on what we have done during the past year. I put it in a card and attach an ornament that also has some meaning. I also like magazine subscriptions. They last all year and they can be recycled when done. One of the best gifts we ever received was a family DVD with cocoa packets, candy canes and popcorn. We had an awesome movie night! Anyone planning to give edible gifts needs to be VERY careful that the household recieving it has no food allergies! To be honest, most jar gifts and other hand made food gifts I recieve are tossed out ASAP unless it is from a close family member or friend that is well aware of allergies. Some people have life threatening allergies, keep that in mind! Also, some people are trying to diet or have special medical diets-that’s another thing to keep in mind. That was my 1st thought too. I throw away everything homemade instantly! It is not worth the risk for families with food allergies. The same goes for bath and body products. Many contain nut oils (shea butter, almond oil, macadamia nut oil), which cannot be used in our house. @Elle B., You know, I didn’t realize so many bath products had nut products. No nut allergies here but that is good to know! I learned the hard way myself that some people substitute items when making food gifts and things you wouldn’t think to find, say in a choc. chip cookie normally! In my opinion there is a balance between being “stuff”/consumer oriented and being tight/cheap. Some gifts may be hurtful if they scream “This was Cheap” especially if that person has done some really nice things for you. I try to treat any occassion for gift giving to give a gift within my budget but a gift that person would truly appreciate. I don’t think there is a thing wrong with buying “stuff” when it’s done in moderation. This post brings back memories of when I was a kid. 🙂 My family had seven kids and every year for a Christmas gift for friends, neighbors, and church members (especially the elderly), we would route out a “caroling” map. Sometimes it took us a couple hours over several days to get to everyone, but we never got sick of seeing the smiles on their faces! My mom and dad would help us assemble boxes of homemade goodies and we would write notes to the people, walk up, ring their doorbell, hand them the box and start singing a couple of songs we picked out for that person. A lot of times they’d join in and sing with us. I’m 23 now, and I wish we still did this, but I’m one of the youngest and most of the kids have moved away. @Corrie, Oh, I would LOVE to have a caroling tradition… what beautiful memories! First of all, as a former teacher and as a daughter of a teacher–teachers get soooo many edible type gifts! I think gifts should always come from the heart. And I also think a gift should be something that person will appreciate. Someone struggling with a diet will not appreciate (at least in the long run) cookies. For me, the best part about giving a gift is getting to know what that person really loves to do and give them something that they will enjoy! I don’t think, when done in moderation material type gifts are bad at all. I personally like gifts that I can keep and down the road remember that person. I try to make every gift I give something meaningful and something that person would enjoy. @Dawn, I agree- the most important thing is choosing something from the heart that fits the recipient. Most of my “consumable” gifting is actually to my own children. I definitely know what they like and that helps cut down on the clutter in our home. Wanted to give those of you a head’s up. I was just at the Dollar Tree and they have five cute little hand puppets for, you guessed it, $1 each. We were able to get a panda, a dog, a monkey, a pig, and an elephant. Since I’d just read this post yesterday (great ideas, by the way), I purchased five for our household and five as Christmas gifts for our nephews. My 2 year old has been going crazy over them for the last hour. As somone else mentioned, who doesn’t love a gift that fosters creativity but is also economical and can be used anywhere. As far as allergies are concerned, you can add a tag to the edible items with an ingredient list so the receiver can see exactly what’s in it. I think consumable gifts are a great idea for “most” people. It’s truly an inexpensive way to give a gift and show you care because you naturally put more thought into a gift you have to make. It may not be for everyone, but you shouldn’t knock the idea just because it isn’t for you. I think we must remember to be grateful for what ever is made for us and receive it in the love it has been given. You are so right! I’ve started doing group gifts where I make a big batch of something and send it to everyone. Last year was homemade hot chocolate with adorable matching cups from the dollar store. This year it will be (bought in bulk) gourmet coffee with homemade biscotti. Everyone loves it! I also add a picture frame or a little something extra. If feels like a big gift, but it doesn’t cost very much. @Ginger, Ooh, gourmet coffee is my #1 gift request for myself… sounds wonderful paired with biscotti- great idea! Any tips on how to encourage immediate/extended families to do this? I am all for consumable gifts and try to aim for those or one significant ‘wearable’ (like a necklace, earrings, etc.) for grandparents and such. However, with my daughter (who turns 1 in a couple of weeks), I am TERRIFIED of the massive amounts of toy-ness that is about to enter our home via birthday & Christmas. I wish everyone didn’t feel the need to get her toys & spend extravagantly (esp. the MIL, goodness!). @Kristen, One of my children has a Christmas Eve birthday, so I can appreciate the cringing at the thought of all.that.stuff! I find that lots of our relatives/friends really do appreciate a list of ideas and will often choose something from there (which gives me an opportunity to put consumable things on there!) In the end, though, it’s far more important to show grace and appreciation… and most grandparents will want to buys those toys. I feel they’ve earned the right. 😉 By keeping MY “clutter-y” purchases to a minimum, it helps balance out all the toys and what-not that come into the house from others. @JessieLeigh, well said! If a grandparent asks me for ideas, I give them, but one set usually asks and the other never does. I’m not going to let it get in the way of a good relationship. Great ideas! I am sure most people on here realize this but for those who may not, you can make the fizzy bath bombs yourself to give as gifts. Here is one website I found. 1st idea: My sister-in-law had a great Christmas idea for my 5 kids last year…she found a fun pair of socks for each one AND a box of character Band-Aids that each kid would have loved (ie. Spiderman for the 9 year old boy, Diego for the 3 year old boy, Princess for the 5 year old girl, etc.) The kids were SO excited to get their own special box of Band-Aids (who knew that could be so fun? ), she didn’t break the bank, and I didn’t have clutter lying around for months to come. 2nd idea: My brother and sister-in-law found a plastic bowl and filled it with microwave popcorn, movie theater candy and the latest Disney movie…GREAT family movie night idea that created fun memories and didn’t take up lots of space! My sister & bil gifted our children with a month of ice skating lessons last year (this is after she spent a week at our house and realized how much “stuff” we had and how much time it took to “manage”). It was such a hit they are doing it again this year and I am thrilled!! Another inexpensive idea my children love are those “pills” that you put in water and turn into a dinasour (etc. )…for a $1 they have a lot of fun watching them grow and then a few days later we toss them. We also love glow sticks/necklaces/fairy wands. We turn out the lights except for the tree and decorate ourselves with necklaces/bracelets and take pictures (without flash). Fun inexpensive tradition. For Christmas this year, we are giving all charitable donations as gifts. We’re using the Food for the Hungry Catalog (), though many organizations have them (World Vision, etc.). So, rather than buy people “stuff,” we’re buying things like chickens, water purification tablets, Malaria nets, etc. in their names. They will receive a card and thank-you note from the organization stating that the item(s) were donated in their name. This way people don’t get “stuff” they really don’t need, and we don’t waste our hard-earned money (and very tight budget) on junk that gets set aside and eventually tossed … and instead we can spend what we would have spent on that towards gifts that really DO change lives. my daughter has three young daughters, the other day she told me that the girls had way too many toys. She asked me what I thought about them taking a Polar Express Train Ride this year instead of getting them toys. I thought it was great. I got my 11 grandchildren 1 large sucker, color crayons, colored pencils and a holiday pillowcase that I made for each of them. I didn’t read all the comments, so someone might have said this, but gum is a big hit with our toddlers! It’s a special treat for them 🙂 Also, we use christmas/ birthdays for pragmatic gifts right now too. Our kids are little, so they are beyond-the-moon excited to get one new toy. If other people ask what to get them, I suggest items like the next size/ season of clothes/ shoes. Our almost 3 year old will get a ‘big girl bed’ for her 3rd birthday (a twin mattress + box spring on the floor with new bedding). A bike at some point. When our second daughter was born, we asked for a toddler convertible carseat for the older one as a baby gift 🙂 we’re fortunate to have family who doesn’t mind giving these types of pragmatic gifts. also, books! we mostly use the library, but if there’s a book or movie the kids love to read over and over, i’ll put that on a gift wish list. a friend of mine gave her 4 year old 12 mommy or daddy dates – 1 for each month of the upcoming year. she did little coupons or something for each activity. ice cream date, picnic, bike ride, first movie theater, etc … simple things for just him and a parent to do. 1 of the 12 was a “big” date – a day at the ski slopes (they live in denver).